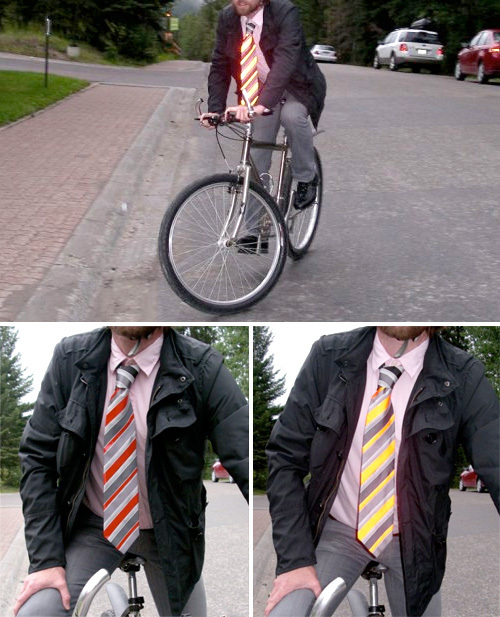 Retroreflector Tie – Corporate American Meets Bike Safety | OhGizmo! By Andrew Liszewski on 11/02/10 • Leave a comment! The humble necktie once again claims the title of ‘perfect Father’s Day gift’ since it now even appeals to eco-friendly dads who commute to work on their bicycle. Designed by Jasna Sokolovic and Noel O’Connell, the Retroreflector Tie is the perfect mashup of fashion and safety. It’s your standard necktie that’s been made with reflective fabrics so in the daytime it’s all business, but at night it’s all safety, reflecting the headlights of oncoming cars making you highly visible. Of course there’s the small catch that it requires you to ride against traffic which is always a no-no, so hopefully the designers have got a reflective sports coat on the drawing table which should resolve that issue.